The Application Portfolio Manager add-on is currently in beta. Application Portfolio Manager is compatible with apps written in all languages and frameworks supported by Heroku. If you’re just getting started with Heroku or Heroku add-ons, please see the Heroku Getting Started Guides or the add-ons overview. 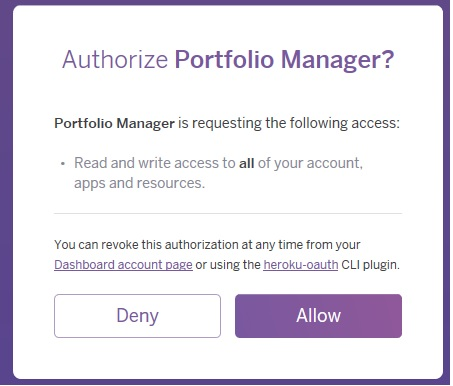 Application Portfolio Manager requests your permission to allow user-level access to your account so that it can obtain the full list of your apps and resources, and allow you to categorize them. By default, Heroku gives only app-level access to an add-on, meaning Application Portfolio Manager wouldn’t be able to obtain information about your full app catalog. Application Portfolio Manager requires this authorization to work correctly. After you select Allow, you are redirected to your Application Portfolio Manager Dashboard. Full instructions for using Application Portfolio Manager are described in Navigating the add-on dashboard. The Application Portfolio Manager dashboard is accessible by your app’s owner (usually you), along with collaborators who have administrator access to the app. Therefore, you should grant administrator access only to collaborators who should be able to access the dashboard. With the exception of the About tab, information displayed in these tabs is obtained directly from Heroku and cannot be modified. You can modify the information presented in the About tab, including your app’s category and description. This information is stored in the Application Portfolio Manager database (not in your Heroku account), so no data is modified in your Heroku account. The sections below provide details on how these values are modified. Enter a category name (e.g., .Net apps under development or Apps released for marketing). Select the app you want to categorize. Enter a short description for the app. This feature allows you to administer information that is displayed in the About tab. You can set app access to public or private. Setting app access does not have any impact on the dashboard or automatically make public apps available to others. Apps marked as public are available publicly to other users only if you deploy your Application Portfolio Manager public site. The app will launch in a separate browser screen using your Heroku credentials. When you set an app to public, you make that App accessible to your company users to launch using their Heroku credentials. The Deploy Public Site link on top of the dashboard allows you to deploy a public site. When your users launch that URL on their browser, they see a list of the apps you have marked as public. All Softtrends Application Portfolio Manager support and runtime issues should be submitted via one of the Heroku Support channels. Any non-support related issues or product feedback is welcome at heroku@softtrends.com.